It had been a month since Tommish left his home in the humid lowlands of Forglar to begin his training at the temple of the Source. Aged only seven summers, Tommish was one of the youngest initiates to have arrived at the temple this year. He had been scared to leave at first - having never ventured more than half a days travel from his village, and never by himself. The rumors and stories he heard tell of enormous horned beasts and winged one-eyed monsters that swarmed the peaks did nothing to help his confidence. But Tommish was determined to become a shaman. He had felt this way since he had seen his village shaman drown a terrible beast of flame with just a few strokes of his webbed hand. Tommish was only a tad back then but had spent the last 5 summers of his youth learning to read the face of the swamp, as an apprentice to the village shaman. It came as a shock when his teacher approached him with the news that he was to travel to the source temples in the Shattered Peaks - the birthplace of the swamp - to further his training. Within a day, Tommish left his village, his head filled with thoughts and fears of his travels to a place he had never seen. His solitary journey north lasted several days, taking him from the boggy expanse of his homeland, through the shallows and finally into the foothills of the Shattered Peaks. Despite his initial trepidation, the trek proved far easier and less eventful than he had anticipated. His training back home, had supplied him with the ability to see the subtle clues the swamp left of its origins in the Peaks. A bit of ruddy dirt on the banks, the roughness of certain stones, or even the presence of driftwood from no plant of the swamp was all that Tommish needed to find his way to the rivers of the source. The final stretch of the journey led Tommish into the mouth of an enormously large canyon made of immeasurably tall striped stone, carved by the rushing waters of a Forglar source river. The stratified walls surrounding him echoed with the sounds of flowing water and the light hum of insects. The banks of the river were covered in tall stalked vegetation, whose leaves shaded the flowing water below. But despite all the activity, Tommish saw no other living creature until he had arrived at a large driftwood structure, suspended by stilts, over the convergence of three rivers into one. He had reached his destination at one of the Source temples. Since his arrival, Tommish quickly adapted to the life at the temple. He was one of the first students to arrive and as a consequence was set to attending to various menial chores by the three high shamans who protected the temple. On occasion Tommish would work up the courage to ask one of the shamans about the temple, its surroundings, and the creatures of the peaks. So far Tommish had learned that the three source rivers were named Anno, Degt and Riannee after the three spirits said to inhabit their waters. The three high shaman of the Forked Source Temple (as the driftwood structure was called), were each Keepers of one of the three rivers. The rivers Degt and Riannee themselves weaved out of sight through sharp canyons carved over millennia. The Anno was most notable for disappearing into the sky via a series of magnificent tiered cataracts, filling the valley with a low murmur of falling water at all times. 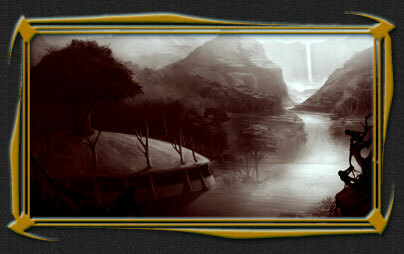 The large river they joined to create was named Forglar, as all source rivers that feed the swamp were called. When he asked about the monsters he had heard of in his village, the shamans laughed, telling him that the peaks were home to many primitive tribal civilizations, but none of them were dangerous to the Forglar. Thus Tommish spent his days, waiting for the time when the high shaman would sound the call announcing the first day of lessons. "Tommish... Tommish... wake up! It's time!" yelled a voice from behind. Opening his eyes slowly, Tommish turned his head to see his friend Kalgt, a fellow initiate, standing knee deep in a pool of moss-covered water. "Time for what?" Tommish said, as he strained his eyes to gauge the time from the shadows of the canyon walls. Kalgt leapt forward splashing Tommish as he landed in his sleeping pool, "They're sounding the reeds ... come on we're going to be late!" Tommish paused for a moment in disbelief as his ears discerned a high-pitched buzzing noise over the rumble of the Anno's falls. Indeed, the reeds were sounding; the time for the lesson had arrived. Bounding into the air, Tommish yelled back, "Come on Kalgt! You're gonna be late!" In minutes the two had arrived at the top of the ridge overlooking the large driftwood temple in the center of the river. The reeds were twice as loud on this side of the ridge - the entire valley resonating with the voice of the swamp. A flurry of initiates were leaping and swimming to get under its canopied roof. With two more leaps down the hillside both Tommish and Kalgt dove into the waters to join the rest of their peers. Once in the river they swam until they were under the shade of the canopy inside the temple itself. The inner part of the temple was shaped like an oval, with a submerged platform chest deep beneath the surface of the flowing river. Above this platform was an elevated walkway and altar where the three high shamans stood watching the young initiates arrive. Tommish and Kalgt climbed on top of the water platform and stood waiting with their fellow students. The temple had been elaborately decorated since the last time Tommish had been inside. Where once the walls and walkways were bare, they were now adorned with brilliantly colored painted scenes of Forglar history. Nora Pearls of all sizes hung from the canopy suspended by ropes made of twine and grass. Behind the shamans on the altar, were many large baskets filled with even more pearls. Tommish could hardly contain his excitement when one of the high shaman, the Keeper of the Degt, stepped forward to speak raising his draped arms into the air. "Blessed be the waters of the Source ... "
Scurrying over a rock-hewn plateau only a single canyon over, were three sparsely clad little horned creatures. They were no bigger than the size of small foxes, with tan colored skin, large vacant eyes and teeth suited for a carnivorous diet. Most notably however, was a tall pair of horns that protruded from their foreheads, accounting for nearly a quarter of their height. One of the three beasts was significantly larger than the others in both height and stature. He was better clothed than his brethren and had a curved dagger made of dark metal sheathed at his side. The second was significantly shorter, and was much fatter than the rest, his bulging stomach sticking far past his nose. His legs were so round he waddled as he walked. The third creature had a broken horn and a mean countenance. His flesh was covered in scars from what looked like countless little claw and teeth marks. 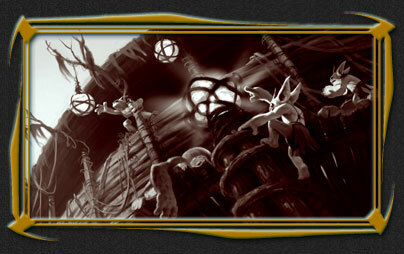 These three little creatures, Moga as the elves call them, looked as if they were lost. It was rare to see Moga these days without the presence of a G'hern, the two species having grown to depend on each other so much that the Forglar even saw them as one entity. They had lost track of their camp when they awoke earlier that morning and had been searching for them ever since. As the three Moga crested the outcropping they were greeted with the sight of yet another canyon. Big and Mean were the first to finish the climb; they stood staring at the geography searching for clues of where their camp had traveled. Fat eventually lifted himself over the edge, breathing heavily as he joined his companions on the ridge. Seeing the vast expanse of yet another canyon and no sight of their camp, Fat let out a high-pitched cry of despair. Irritated with the sound of the Fat Moga's wailing, Mean smacked him in the gut knocking Fat to ground. 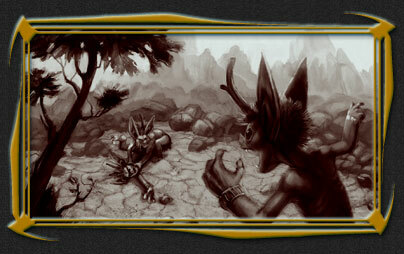 The broken horned Moga stood over Fat kicking dust and rocks in his face as he tried to regain his feet. Annoyed, Big angrily snarled and pushed Mean to the ground. Big then drew his dagger and raised it into the air, as both Mean and Fat rose to their feet. Intimidated by the sight of the blade, Mean let his handful of rocks fall to the ground. Returning to gaze at the expanse of the canyon below them, the three Moga searched again for signs of their camp. As far as they could remember, they had been with their camp traveling down to the canyon lands of the peaks. Last night they made camp at a stream, and the three little Moga found a nice cave out of sight from the main camp. When they awoke, the camp was gone, leaving no clues as to where it had disappeared. They had waited at first, certain that their camp would return. But after nearly an hour of waiting, Fat began to cry out for food, and so three Moga left the campsite to go hunt for breakfast. Not wanting to be slowed down by Fat, Big and Mean took off to go hunt by themselves. Fat wandered up the stream searching for something he could capture. Only minutes later, Fat found what he was looking for: a large purple bird twice as large as his head bathing itself in the waters. Fearful of frightening the bird, Fat crept up slowly, taking care not to step on rocks or branches that would reveal his presence. Once he was close enough, he pounced forward, reaching for the bird with his tiny hands. When Fat splashed into the water, he was surprised to realize that the bird was still between his hands, screeching intensely, flapping its one free wing trying to get away. Hearing the noise back at the stream, Big and Mean came running to see what their brother had caught. When he saw them running, Fat called out excitedly. They rushed over to where Fat was standing still holding the frightened bird. Looking around Big found a large flat stone for Fat to hold the bird upon. Obediently, Fat pinned the miserable animal to the rock with his hands, and winced as Big removed his dagger from its sheath. Big raised the dagger in the air and made a practice swipe while the bird screeched and twisted trying to free itself from Fat's grasp. Hearing the noise, Fat peeked with one of his eyes to see if the bird was still alive, only to see Big bringing the blade down for the mortal blow. Frightened, Fat cried out, jumping away, and releasing the bird from his grasp. Big's dagger clanged into the rock chipping a bit of stone to the ground. Angry at their lost quarry, Big punched Fat in the face, knocking him into Mean, and soon the three creatures were fighting again. Eventually after the failed hunt, the three Moga resolved to try to find their camp, which led to their mornings climb up the ridge. Seeing the next canyon stretched out before them under the noonday sun, all three Moga began to lose hope that they'd ever rejoin their lost camp. Mean was the first to give up, turning around to walk back down the way they had come. The Fat Moga stood watching as Mean stepped away, looking at Big to do something to stop him. Hearing the rocks crackle beneath Mean's feet, Big turned around and yelled pointing towards the other side of the canyon. Mean stopped where he was and yelled back, hopping up and down pointing back down the way they had come. While Big and Mean argued about which way to travel, a cry suddenly echoed through the outstretched canyon. The three Moga froze in place as the sound came again. It was a weary noise, much lower in pitch than the snarls and growls the Moga could produce. When it came again, all three Moga cried out as one, scrambling down the rough slope and into the canyon below them, towards the sharp bend further downstream. All former semblance of disorganization between the three vanished in an instant. Back and forth the low cry would sound followed by the Moga calling back, as they bounded from rock to tree, running at points towards the direction of the noise. As the three Moga rounded the bend, the canyon opened up to a large valley where three rivers joined as one. At the center of their convergence was one of the Froggy temples, and a little ways closer, their lost camp. 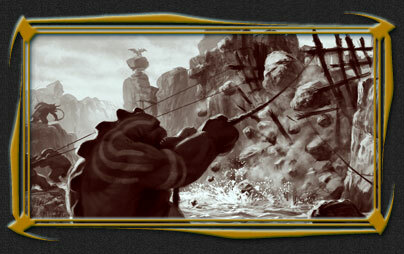 Deeper in the Shattered Peaks, four large one-eyed giants and a G'hern sat beside a flowing stream. Beside them rose an enormous mound of boulders supported by a large braced wooden wall with many large ropes trailing across the stream. They were all sparsely clad, wearing little more than the furs of various animals about their waists. Their skin was covered in dust and dried mud. They rested in a circle, some on stones, others lying in the mud about the riverbank, each looking completely exhausted. Yawning one of the giants complained, "Howah much long dink must wait?" "Like last time askid ... Voyuhl says til hearuh sign," replied another shifting in his seat on one of the stones. A third giant, this one sitting on the ground replied, "Whad kinna sign dink? Whadid sign hearid alreadee?" "Den Voyuhl throwah fit alreadee," the fourth and biggest of the four said as he slowly stood from the ground, "Break over - move stone time!" The other giants groaned in unison as they made to stand while the G'hern roared in discontent. They had been amassing stones at this point in the stream for the last three weeks. Before that they had spent their time building the wooden braces that kept the boulders from tumbling downward. All of this work had been done under the relentless supervision of an ill-tempered Voil - a large bat-like race of creatures from the very summit of the Peaks. The Voil told them that if they worked hard enough, at some point they would receive a signal that would let them know they could stop working. Thus they moved countless large stones from all around the canyon, dropping them behind the braces, waiting for the moment the signal was sounded. Originally there were more G'hern for the task, but the Voil had taken to plucking them from the ground and dropping them into the pile of boulders for sport. Each died on impact serving as a brutal reminder to the others of the strength of their leader until their corpses were buried under the next day's worth of boulders. After a few more trips of stones, one of the giants complained aloud, "Tireda moving stones!" "Tireda whining!" the larger giant mockingly said, "Tireda whining Ooneye! Tireda!" "Tireda damned bossiness!" replied the first giant again, frustrated with the larger one. Overhead a shadow flashed by as a large winged creature perched atop the mound of stones, its wings spread wide in a majestic display of their immense size. "Silence!" screeched the beast in a sharp burst of abrasive syllables. The beast stood nearly as tall as the giants, but was significantly leaner, with an ugly gnarled face and immensely muscular legs. Its body was armored in dark black plates of metal that gleamed as if they had been shined recently. Where the plates did not cover, the creature's thick gray fur stuck out blowing slightly under the breeze. On its back it wore a very large spear at least as tall as one of the giants. With their cruel leader now watching over them, the four giants hurriedly returned to their task of moving stones onto the heap. The beast flapped its wings from time to time, twitching its large ears as it focused on the noises of the river in this canyon. "Work faster!" screeched the Voil startling the giants walking past, its voice more a high pitched crackling noise than something intelligible. "You got nothing done while I was gone!" The laborers worked silently now, bearing the large boulders up the ramp, heads down-turned lest they meet the same end as their old companion. Each was bringing a second stone to the mound when suddenly a piercing cry filled the canyon. The giants and G'hern screamed in agony as they dropped their stones, covering their ears from the noise. The Voil seemed unfazed, taking to the air shouting with its sharp grating voice, "You fools! Uncover your ears! Get to the ropes! It's the signal!" All of the workers quickly ran down the slope each grabbing one of the ropes bound to the wooden brace. The sound stopped nearly as quick as it had come, but was followed by a deep rumbling noise that seemed to shake the very core of the peaks. Standing at the floor of the growling canyon the giants began to tug at their respective ropes. The Voil hovered nearby counting off for the giants as they pulled and pulled and pulled. On the end of their fifth pull, a cracking noise came from the wall as the combined strength of the giants suddenly broke one of the supports of the wooden brace releasing a wall of stone crashing into the river itself. Within moments the canyon was sealed from wall to wall with the enormous barricade of stone the giants had been building. The giants, unable to escape the downpour of stone, fell prey to the very device they had created. The Voil took to the sky the instant the braces creaked, looking back only once to make sure the river was indeed stopped behind the dam of boulders. "... For it is through the strength of the Source that Forglar lives," echoed the temple as they finished the prayer. Standing on the water covered platform, Tommish and his fellow initiates watched keenly as the Keeper of the Degt brought his arms back to his sides and stepped back to stand with the other shamans. As he did so, the faint glow of the Nora Pearls and water faded back to their normal luminescence. "When the swamp speaks we must listen," said the three keepers in unison, "the swamp knows more than we can ever know, and we must remember this despite what we learn. We must remember to listen." 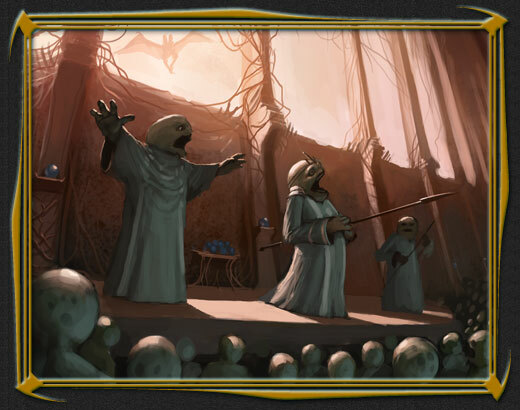 The keepers of the Anno and Riannee stayed back while the Keeper of the Degt returned to the front, "The voice of the swamp is loudest at the Source. This is why you come here. To hear how the swamp whispers. Listen..."
Tommish strained to hear the voice of the swamp. Despite his efforts, all he could hear was the trickling waters around where the stilts entered the water and the occasional breath of Kalgt standing beside him. The temple was silent save for these sounds, when suddenly a shrill piercing noise screeched through the valley. Tommish's eyes opened widely as he heard what he thought was the voice of the swamp. Yet more than the whisper the Keeper had mentioned, it sounded as if the Anno, Degt and Riannee were screaming. He looked to Kalgt and saw that he had heard the noise too. The two youths looked wide-eyed back at the altar to see the three Keepers talking quietly amongst themselves bearing grave expressions upon their faces. Within moments the shrill noise stopped, and was replaced with a low rumbling noise from all around. Nora Pearls suspended by twine to the roof of the canvas began dancing in the air as the Tommish felts his bones vibrate. Tommish felt a fear enter his stomach that he had not felt since he first left his home. "Tommish is this part of the ceremony?" whispered Kalgt, tugging at his arm. But before Tommish could respond, the Keeper of the Degt stepped forward again yelling, "Initiates, we must delay our ceremony... something is wrong with the source." As if on cue, the soft crashing noises of the Anno's falls grew faint, and the valley was silent for the first time in its existence. In a few seconds, the waters of the river began receding beneath Tommish's feet revealing the muddy slime covered rocks of the surface. Within seconds the acrid smell of the river bottom engulfed the temple. The Keeper of the Degt spoke again, "Initiates do not leave the templ -" his final word cut off by another loud screeching noise, this time from above, as the flash of a spear point drove through the high shamans chest. The spear was nearly twice the height of the high shaman, sticking out half as much on either side. The force of impact nearly caused his body to fall forward and into the platform of screaming initiates as the other shamans rushed to support their dying brother. Tommish looked to the windows of canopy to see the shape of a large winged beast flying away, suddenly remembering every monster story he had ever heard about the peaks. The other initiates were a screaming mass of panic - some even ignoring the high shaman's final words hopping off the platform onto the mucky rocks below. Tommish looked to his friend asking, "Kalgt what should we do?" But Kalgt was beyond meaningful words, he just kept muttering, "I don't know, I don't know, I don't know" as he shifted back and forth on his legs. Tommish reached to shake his friend, "Kalgt its gonna be okay." But Tommish's words were drowned out by more of the painful screeching from above, as more spears pierced through the canopy of the temple, some finding targets, others only driftwood. The spears broke Kalgt's daze and he stared at Tommish with a look of fear in his eyes. The two remaining high shaman, swirled around the dead Keeper, chanting words of magic as more and more initiates hopped off the platform into the riverbed. With a flash of brilliant blue light, both shamans raised their webbed-hands to the sky as the valley resounded with a bubbly screech that fell downward. They had killed one of the monsters. "Kalgt - I don't want to be around for the next volley of spears... we gotta go." Tommish said hurriedly to his friend. Kalgt nodded in assent and the two young boghoppers followed their peers into the muddy river. Nothing could have prepared them for what they saw next. Closing in a massive wave from the far bank of the river was a swarm of horned beasts - both big and small - running towards the group of initiates gathered around the temple's support stilts. Looking around, Tommish saw that they were moments away from being surrounded. "Kalgt! Everyone! Find a weapon - we have to defend the temple!" He looked to the ground to see if there was anything he could use to defend himself. He only found a slime-covered branch, but it would have to do. Kalgt picked up a rock, and stood next to Tommish. The small group of initiates in the riverbed formed into a circle beneath the stilts as more flashes of blue light burst from the temple followed by more pained screeching. Frightened of the coming moments, Tommish began reciting the prayer they had said together only minutes before, "Blessed be the waters of the Source!" as his fellows joined in. The swarming army answered this prayer with a terrible cry as they clashed with the youths beneath the temple. Within moments the battle was over. Upon tearing through the youths, the Moga began climbing the stilts up into the temple to gather the treasures of the temple, while many stout G'hern stood at the base of the temple waiting to tear it down. Perched at the top of the canopy a pair of Voil shouted to the army below, "We have finally taken back that which is ours!"